Overview and Purpose of the Assignment--Since Fall 2008 students in my English 2010 course created magazine-style portfolios comprised of revised essays and a reflection (Editor's Note). After SLCC implemented ePortfolio, having students create an online magazine-style portfolio seemed like a natural evolution of the project. I adapted the project so that students could experience our ePortfolio platforms in different settings, as well as for different purposes and audiences. This project adaptation offered students more dynamic and multimodal means for them to communicate their ideas. After a few semesters of assigning this project, I felt like this project could further evolve. My colleague, Professor Lisa Bickmore, felt the same way about portfolio projects in her 2010 course. 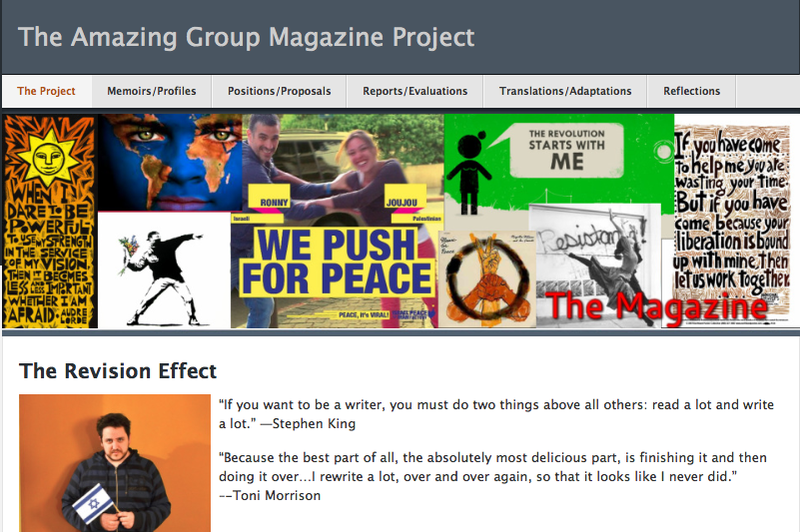 Together, we adapted the individual online magazine project into a group project and the results are rather incredible. Click on the image below to experience details of the Group Online Magazine project. Note: the reflection prompts are included in the description. Screen shot of magazine description homepage. Students communicate effectively. This includes developing critical literacies—reading, writing, speaking, listening, visual understanding—that they can apply in various contexts; Organizing and presenting ideas and information visually, orally, and in writing according to standard usage; Understanding and using the elements of effective communication in interpersonal, small group, and mass settings. Students think critically and creatively. This includes reasoning effectively from available evidence; demonstrating effective problem solving; engaging in creative thinking, expression, and application; Engaging in reflective thinking and expression; Demonstrating higher-order skills such as analysis, synthesis, and evaluation; Making connections across disciplines; Applying scientific methods to the inquiry process. Students develop the knowledge and skills to be civically engaged. This includes understanding the natural, political, historical, social, and economic underpinnings of the local, national, and global communities to which they belong; Developing the awareness of both civil rights and civil responsibilities for individual and collective action in a democracy; Engaging in service-learning for community building and an enhanced academic experience; Develop the knowledge and skills to take leadership roles. Students develop computer and information literacy. This includes using contemporary computer hardware and software to effectively complete college-level assignments; Gathering and analyzing information using technology, library resources, and other modalities; Understanding and acting upon ethical and security principles with respect to computer technology and to information acquisition and distribution; distinguishing between credible and non-credible sources of information, and using the former in their work in an appropriately documented fashion. Students develop the knowledge and skills to work with others in a professional and constructive manner. This includes engaging with a diverse set of others to produce professional work; Interacting competently across cultures; understanding and appreciating human differences; Understanding and acting on standards of professionalism and civility, including the SLCC Student Code of Conduct.